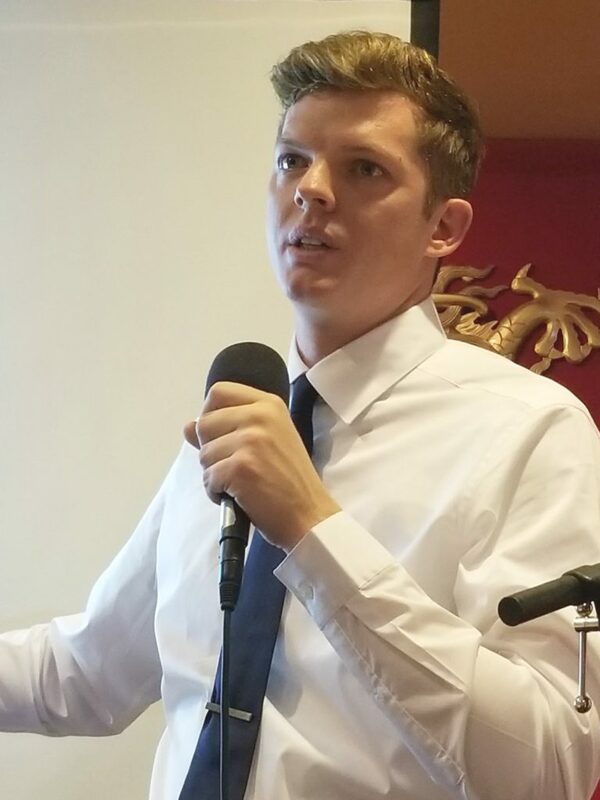 Democratic candidate Billy Kovacs outlined a detailed plan for how he would grow Arizona’s economy as Tucson’s Congressman. “We can grow our economy without giving massive tax breaks for corporations,” he said at a recent meeting of the Democrats of Greater Tucson. Education – creating an educated workforce. Renewable resources – solar energy and energy storage. Public transportation – expanding the Tucson streetcar in all directions and preserving Amtrak in Arizona. Infrastructure – creating millions of jobs with a $1 trillion investment over 10 years. Immigration – creating a path to citizenship for 11.3 million unauthorized immigrants. “We need to attract companies and workers to Arizona, and I’m talking about smaller companies that want to live in Arizona because of our natural resources and trained personnel from the university — and not for tax breaks,” he said. Two years of tuition-free higher education, with the federal government covering 75% of the cost. “By the year 2020, 65% of all job openings will require an education or skills training beyond high school.” Currently, only 42% of Arizonans have an education past high school. Reduce college debt by expanding income-based repayment plans so that graduates don’t have to pay more than 10% of their income toward student loans. The key to all of this is electing Democrats to the Arizona Corporation Commission, Kovacs said. Republican members have crushed solar energy, ending net-metering credits to solar rooftop panels that generate excess electricity and instead giving rate hikes to old-technology power companies. “Support for solar energy is support for American jobs,” Kovacs said. He added that solar storage batteries are the next hotbed within the renewable energy sector. “We have amazing solar storage companies out of the U of A that could get funded,” he said. Over the last five years, 150 businesses have opened their doors along the route of the Tucson streetcar. It has attracted more than four times as much economic investment as the project cost. Kovacs would like to expand the line down 6th Street and on Broadway, with eventual additions connecting shopping districts on Campbell and First Avenues. “The same way the education allows people to interact with other cultures and socio-economic classes, so does public transportation,” he said. He also favors protecting long-distance Amtrak routes, which has 8 stops in Arizona. “150 Arizona jobs depend on Amtrak. It has a $12 million economic impact in the state,” he said. Recent Republican legislation would have cut $1.1 billion in Amtrak funding. Highways and bridges in the state need maintenance and repairs, and state transportation funds face a $30 billion shortfall over the next 25 years. Kovacs said an investment of $1 trillion in infrastructure over 10 years would create several million jobs. “We need to protect and defend DACA and pass the DREAM Act,” Kovacs said, calling for a pathway to citizenship for the 800,000 immigrants who were brought here as children. “Regardless of how much English you can speak, you should be able to come to the United States and have the opportunity to realize the American Dream,” he said. Fully legalizing 11.3 million unauthorized immigrants would add $2.1 billion in state and local tax revenue each year, according to Kovacs. Providing them a pathway to citizenship would increase GDP by $1.2 trillion over 10 years and create 145,000 jobs annually. He noted that immigrants compose about 28% of small business owners and are twice as likely to become entrepreneurs than that native-born population. Voters can find out more about Kovacs’ position on these and other issues by visiting https://www.kovacsforcongress.com/16498-2. “Over the last five years, 150 businesses have opened their doors along the route of the Tucson streetcar. It has attracted more than four times as much economic investment as the project cost. This project was made possible by Obama’s 2009 American Recovery and Reinvestment Act, if I’m not mistaken. Based on what I’ve read about him, Billy Kovacs is a perfect example of why WE NEED SOME YOUNGER PEOPLE in Congress. Keep up the good work Billy. Our family in Tucson fully support the 5 point plan. Let us know how we can help.